Last October, I posted that Weird Beard Brewing hoped to be brewing by the end of last year. Alas, further delays (all well documented on their blog) meant this wasn't to be. However, after putting in lots of hard work overcoming hurdles and much cajoling of suppliers, Bryan Spooner and Gregg Irwin are finally able to call themselves professional brewers, and I'm sure they're absolutely delighted about that. On visiting the brewery today, I was taken aback by the transformation the space has undertaken since I was last there just a few weeks prior. 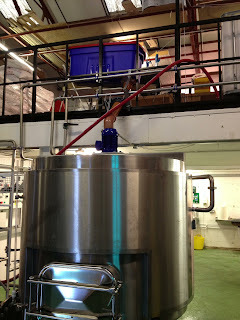 Back then, the brewing vessels were in place but nothing had been installed. The cold room was half built and the place felt huge with lots of open space. Fast forward a few weeks and it has been transformed into a fully operational brewery. Pallets of casks, kegs, bottles and malt have been squeezed into every corner. The cold room is full of packaged beer and the fermenters are full. Anyone passing by this industrial unit on a quiet trading estate in Hanwell would never guess the hive of activity lurking within. 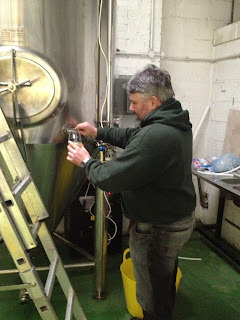 As I walked through the door, Mike of Ellenberg's Brewery was busy cleaning down the bottling tank to prepare it for another bottling session and Gregg was hosing down the floor, washing away the traces of last week's brewing and packaging marathon. Bryan and Gregg have brewed four different beers since the first sack of malt was poured into their improvised hopper and have many more planned. I was able to sample all four, which are at various stages of the fermentation and conditioning process. Single Hop Series No. 1: Chinook (a.k.a. Boring Brown Beer) is a fascinating English style ale that's been dialed up to imperial territory at 7.4% and massively hopped to a theoretical 100 IBU's. The classic banana and toffee nose offers no clue as to the bitter beast that lurks within. Faces may be melted when this hits the bar. Miss The Lights is a 6% IPA with a delicious fruity aroma. It's perfectly balanced and offers a lovely rasping bitter finish. These first two beers have been packaged and are conditioning in the cold store. Black Perle is a milk stout aged on coffee beans. The nose on this is wonderful, immersing you the roasty notes of the Costa Rican beans, locally sourced from London's Alchemy Coffee. I have a feeling this is going to be pretty special on cask. Mariana Trench is a 5% Pale Ale that smells and tastes like freshly squeezed oranges. I really liked the prototype of this beer and can imagine that sinking a few nicely chilled keg-dispensed pints on a warm summer's day would be a pretty cool way to spend an afternoon. Ah, I wish this cold weather would bugger off! Upcoming brews include Fade to Black (a Black IPA) and Saison 14, both of which will feature Gregg's favourite hop, Sorachi Ace. Fade to Black was a beer I first sampled almost a year ago at their first meet the brewer event at The Rake, and I thought it was brilliant. I'll definitely be seeking that one out when it's released. If these first four brews are anything to go by, Weird Beard aren't going to ease themselves in and ramp things up slowly by playing it safe. It's going to be full on nose to the grindstone stuff with bold beers and fantastic branding to match. It may have taken them some time to reach the start line but ladies and gentlemen, Weird Beard have arrived, and they've absolutely flown out of the blocks! Oooh!! Can't wait to see bottles winging their way to the West Midlands! Good to see some fruits finally ripening for Gregg et al. Yes, they've worked their socks off to get up and running. I'm looking forward to seeing the results on a bar. Not long to wait now! This is really good news. I've been eagerly waiting for Weird Beard to get off the starting line and now they've done it! I live relatively local to Hanwell, do you know if their beers will be available at the brewery within the next few weeks? I read somewhere that they will have some beers at Egham at Easter. Cheers Andy, really nice write up!